Tutors with decades of experience in the industry deliver a complete, three-step ACS Gas Training Course. With a mixture of theoretical knowledge and practical skills making up the course, students learn everything they need to know to go onto become a qualified gas engineer. On-site experience is a mandatory part of the course and it is invaluable to gas trainees. Here at Options Skills, we provide you with support and the best platform possible from which to gain your ACS qualifications and become a gas safe registered gas engineer. Available for those who are complete beginners, as well as those with existing industry experience, initial training to become a gas engineer will be tailored to suit your needs. Stage one of the ACS Gas Training Course is delivered in small groups at one of the Options Skills training centres. You will be taught a mixture of theoretical information and practical skills, ranging from health and safety instruction to gas cooker installation and servicing. This part of your gas training is designed to be an in-depth introduction to gas work and installation, preparing you to move onto stage two where you will undertake on-site work experience with a qualified gas engineer. Centre led training can be undertaken on either a full-time or part-time basis and you will be tutored by experienced gas engineers who have years of experience in the industry. Stage two of training is a legal requirement for anyone training to become a gas engineer. During this stage, you will spend a minimum of 100 days working with a qualified gas engineer. Under their supervision, you will undertake a range of gas work, documenting this to complete a portfolio. Your portfolio acts as evidence of the work you have undertaken as a trainee and must be of an acceptable quality to allow you progress to the next stage of training. Options Skills can guarantee to provide students with a gas engineer with which to work if necessary. The time taken to complete the portfolio will vary from trainee to trainee. There is a minimum duration of 100 days and a maximum duration of up to 2-years for you to complete this stage of your training. Before moving onto stage three, you must pass a summative assessment. This includes; three written assessments, one practical assessment and portfolio evaluation. It is upon the completion and passing of this that you can go onto book your ACS Assessment. In your final stage of the ACS gas training course, you will be invited back to the training centre to undertake your ACS initial training and qualifications. Including a practical and verbal examination, you will cover Gas Core Safety, Central Heating and Boilers, Gas Fires, Gas Cookers and Flue Gas Analyser – otherwise known as the domestic suite of gas qualifications. ACS gas qualifications must be renewed every 5-years, although the process just involves reassessment for existing registered gas engineers. Once you have successfully passed your ACS Gas Assessment, you may now apply to the Gas Safe Register for membership in your own right. Membership of the Gas Safe Register is renewable annually and fees are payable directly to the Gas Safe Register. With Effect from November 2017, all New Entrants to the Gas Industry in the UK must follow a standardised Level 3 RQF (Framework of Regulated Qualifications) Gas Course that is delivered by an approved Gas Training Centre. The acquisition of initial Nationally Accredited Certification Scheme for Gas Fitting Operatives (ACS) certificate(s) of Gas Safety Competence. The acquisition of a Framework of Regulated Qualifications (RQF) in England, Wales and Northern Ireland or Scottish Credit and Qualifications Framework (SCQF) gas utilisation certificate. The issue of a Training Completion Certificate (TCC). Suitability This programme is designed for New Entrants to the Gas Industry. Suitability For new entrants to the Gas industry. Prerequisites For candidates that have completed G1 Managed Learning Plan and G2 on-site portfolio. Candidate will only be assessed for appliances/ qualifications listed below if he or she has built sufficient evidence within their portfolio. Why Train As A Gas Engineer? How Will I Find A Gas Mentor? Learning a trade such as gas engineering opens up a world of opportunities. Not only do you learn a skill for life, but you create the opportunity to become your own boss. Being self-employed, you can set your own working hours, rate of pay and choose which jobs you will undertake. In the industry, you also get the benefit of variety. No working day will be the same, you’ll be working on different jobs, for different people and in various locations. 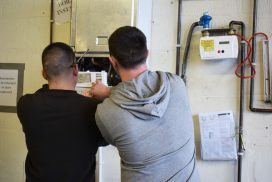 With a shortage of skilled workers across the board and an increase in housing being built, tradespeople such as gas engineers are in high demand. Those already in the trade are earning an average annual income of £32,500, but there is great potential for an even higher amount. For more information, read Why Become A Gas Engineer and How Much Can I Earn As A Gas Engineer. Options Skills offer a great service and we provide you with the best opportunity to begin your career as a gas engineer. Throughout training, you will have a student liaison manager ensuring everything is going smoothly and who you can talk to if ever necessary. We continue to offer support even after you’ve completed your ACS gas training course and qualified. During your time here, you will be taught by tutors with years of industry experience, who really know the ins and outs of the industry. You will also undertake on-site training, ensuring you’re fully introduced to the industry and have sufficient experience before you begin working independently. If you know an experienced gas engineer who is happy supervise you, you can work with them as you build your portfolio of work. However, if you don't, here at Options Skills, we guarantee to find you a qualified gas engineer to act as your mentor during step two of your ACS gas training course. Due to years of experience in the industry, Options Skills have built up an impressive network of gas engineers, meaning we will be able to place you with someone local to allow you to complete your gas portfolio. If you have previous experience working as a gas engineer, we will not ask you to undertake any training other than what is necessary. The best course of action, if you have experience in the industry, is to call our advisors to discuss your situation. They will be able to arrange a training plan tailored to you. While we will provide students with excellent training - both practical and theoretical – we will not teach you how to pass the exam. Passing any exams or assignments is dependent on your level of knowledge, dedication and hard-work. near you for your portfolio building. Spread the cost of your training. Subject to status. Find Out More.